I traveled around the world from 2014-2016 for our honeymoon, and already has settled down in our hometown Tokyo. We visited more than 50 countries: Albania, Argentina, Austria, Bolivia, Bosnia and Herzegovina, Brazil, Bulgaria, Cambodia, Chile, China, Colombia, Croatia, Cuba, Czech Republic, Denmark, Ecuador, England, Estonia, Finland, France, Greece, Guam, Hong Kong, Hungary, Indonesia, Italy, Laos, Latvia, Lithuania, Macedonia, Malaysia, Mexico, Monaco, Mongolia, Montenegro, Morocco, Norway, Panama, Paraguay, Peru, Philippines, Poland, Russian Federation, Slovakia, South Korea, Spain, Sweden, Taiwan, Thailand, Turkey, United Kingdom, United States, Vatican City State, Vietnam. We had a great time with our wonderful hosts all over the world. Now we decided to open our cozy home for travelers to share the hospitality that we received by our wonderful hosts. Yuka: 34 years old, a crazy wife! Loves meeting new people and having fun! Masato: 34 years old, an always smiling husband! Loves drinking and playing with dogs! We LOVE meeting new people and making friends all over the world. Yuka: foods! and drinks! I can eat unlimited! Masato: Beers! Sushi! dogs! And other animals! Yuka: loves and plays Japanese traditional music. Koto! Sansin! Masato: loves jazz and classic music. Enjoy Koto and Sanshin lessons & tea ceremony experience! Loved this experience. The Koto and Sanshin was easy to understand and they were very knowledgable and professional. We felt like a family. Our experience with Yuca was one of a kind. We learned how to play the Japanese koto and sanshin. We wore beautiful kimonos that Yuca's grandma made and we had a mini-tea ceremony with traditional Japanese sweets. We really enjoyed our time with Yuca and her husband, they were both warm and welcoming. The directions to get to Yuca's home were clear and easy to follow. They also recommended a fun sushi place to eat around their house. This experience is a must if you are into traditional Japanese culture. Such a great experience! Definitely a must do when you come for a holiday in Tokyo! Both Yuka and Masato were great hosts and the whole experience was very relaxing, knowledgeable and enjoyable! If you are interested in having a truly unique experience, book this session! 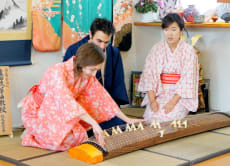 Not only will you receive a lesson on how to play the koto and sanshin (two traditional musical instruments) but you will get to wear a beautiful kimono and learn about the tea ceremony. Not only were Yuka and Masato great hosts but they are genuinely interesting and kind people. Yuka was very patient and informative when teaching about the koto and sanshin. I had such a wonderful time! !